From the outside, 455a Sackett seems like an ordinary Brooklyn brownstone. Unassuming and uninviting, you wouldn’t look twice at the building if you were to pass by. However, to those few people that know, there’s a dark history associated with the building. A history of unexplained fires, disembodied voices of children, and other unimaginable tragedies has plagued the building and several former tenants. 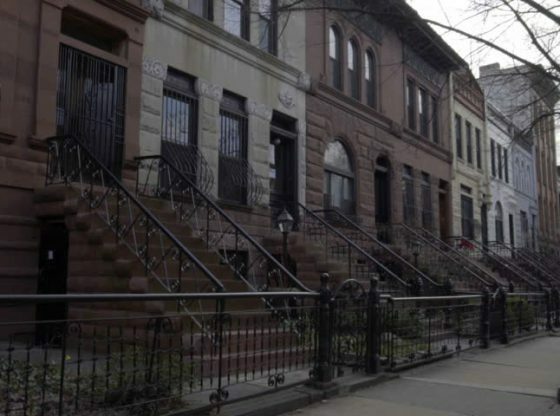 On April of 1998, Jane and her family moved into the brownstone unaware of its dark history. I wrote about this briefly in a prior article in 2001. To recap: we moved into 455a sackett street when I was 14 years old, on april 1, 1998. from the moment we moved in, something was so not right. It was an incredibly dark apartment… though we should have been thrilled because it was the first apartment we’d ever had with more than one floor. There were three floors (including the basement) and it was nice, if you could ignore the feeling of someone standing just behind you, or staring at you wherever you went. Within two weeks of moving in, I was raped in my own bedroom by a man from the neighborhood. An elderly woman who’d lived right next store for most of our life informed us that no one had occupied our apartment for more than a year at a time since as long as she could remember… she also related that terrible tragedies befell all of said people, within only a few weeks of moving in, continuing through the day they moved out. Though we all had eerie feelings in the apartment, we’d not noticed anything too weird. The apartment was very uninviting, cold and damp. We tried to decorate it, warm it up a little, but nothing helped. Another thing was that no matter what we did, we could not get a phone installed. we had the phone company over about 4 times to fix the wires, but no matter what they did, we would get absolutely nothing, not even static. so we were pretty isolated. After that, my neighbor confided in us that “strange things” have always gone on in my building. In the 30’s or 40’s, a fire had killed a little boy within a month of the family moving in, in the 60’s, a couple were “whacked” by the mob because of some insidious affair. There were no records because the church’s records had been burned in a fire so we couldn’t get anymore information than what people said. There were other things that happened, a friend of mine coming into my apartment and seeing a little boy in burnt rags staring at her in my bathroom mirror.. she ran out crying and refused to set foot in my door again. Another friend who slept over (note: both friends were not told of our experiences) and awoke in the middle of the night swearing that she saw a woman walk into my room through the door. We moved out a year to the day later, as soon as we could find a new apartment. We found out some more after that. The people that moved in after us tried to renovate the basement, and found the body of a little boy in the wall. They left suddenly one night not too long after and never returned. Another couple moved in and left as inexplicably as the last. And so on and so forth to this day. Since then, we met a woman whom had gone to my mother’s office (she’s a nurse that works in a doctors office) because of a nervous condition. My mother noticed the address on her insurance card didn’t match the one listed, and the woman explained she had only lived at 455a sackett street for a few months, and had to leave because her mother had died along with various other tragedies from the 1st week of moving in. My mother asked if the woman ever noticed anything weird… well, the woman explained exactly what we had gone through, perhaps the cause of her condition? We are all fine now, happy to be out of there and we’ve moved on. We still see our old neighbor once in a while, and she always says the best thing we ever did was move out of that god forsaken house. Needless to say, we agree. We’ve not been haunted since, and life is good. If there is one thing we learned, I’d say it was to trust our instincts. If you get horrible vibes from a place, don’t put it off as folly… it might just save you a whole lot of trouble. I lived in that house for three years in 2003, It was the creepiest place ever. I had the room that I think was your brother’s. It was the size of a small closet. The ceiling still had a bad patch job from where the ceiling probably fell in before. There was also remnants of the fire. I had to remove the radiator from the tiny room and there was a ton of soot behind it. I never felt safe in that place. Under the porch in the back there was a small storage room. The entrance was outside under the porch. Me and my roommates went in after the door popped open one day. There was a kneeler altar like thing and no joke a pair of girl’s roller skates with cake on blood and a small boys clothes. It was so creepy. We called it the goat hole. The people that moved in after us (they bought the place) completely gutted it and renovated. I could only imagine what they found in there. To this day the brownstone is still on the market. The list of former tenants keeps growing, with most of them not staying for too long. Whether you believe Jane’s story or not, one thing is for certain…Brooklyn’s history is dark and full of ghosts.